Late last year I stumbled across a 02Turbo in my own backyard, so to speak. It's been sitting partly exposed to the sky in a house garden for 20 years. I know the owner as he has connected with me over my Tii cars he has seen around & about. I think this is an original turbo body. It has the strengtheners in the rear body over the axle, the wider rad aperture. 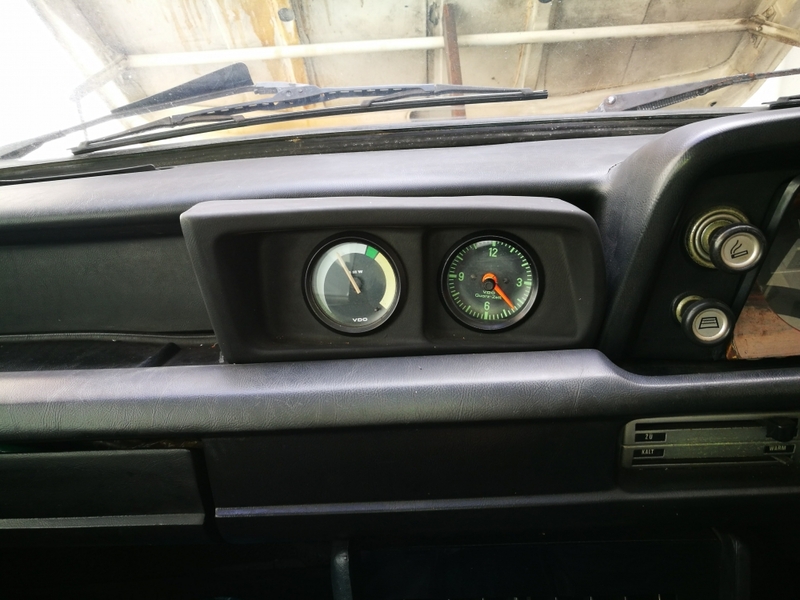 However, it's been converted to Right Hand Drive...rumour has it 2 cars were converted in the UK back in '74...no idea if this is one of those...it appears to have been done quite well with the exception of the gauge pod (!). Its got the stiff roll bar, the full set of wheel arch extensions, carlos fandango wheels, airdam & spoiler. Its missing waist trim. Gearbox appears to be a 4 speed. The reason I write is to ask if theres any chance to find the missing parts. 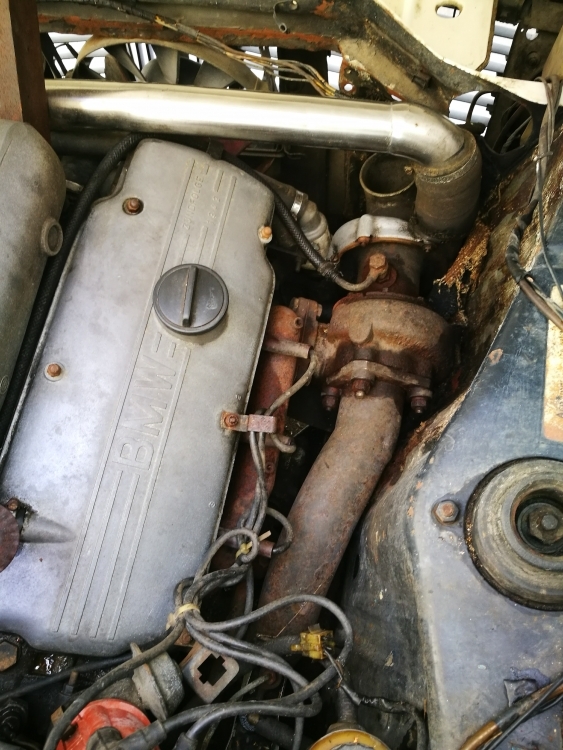 The engine is partly dismantled, most parts are in the trunk but the Kugel pump and its 'pressure sensing' device attached to teh back of teh pump are missing. Owner says his son took it to europe for repair many years back & lost it. Do you think there's any chance to find this complete part? Or to fabricate parts to modify a standard Tii Kugel ? Concerning the turbo: is there any chance it will spin again?? Wow. interesting story. I'm not one of the experts here and I haven't seen what a RHD conversion would look like but you've certainly peaked my interest. 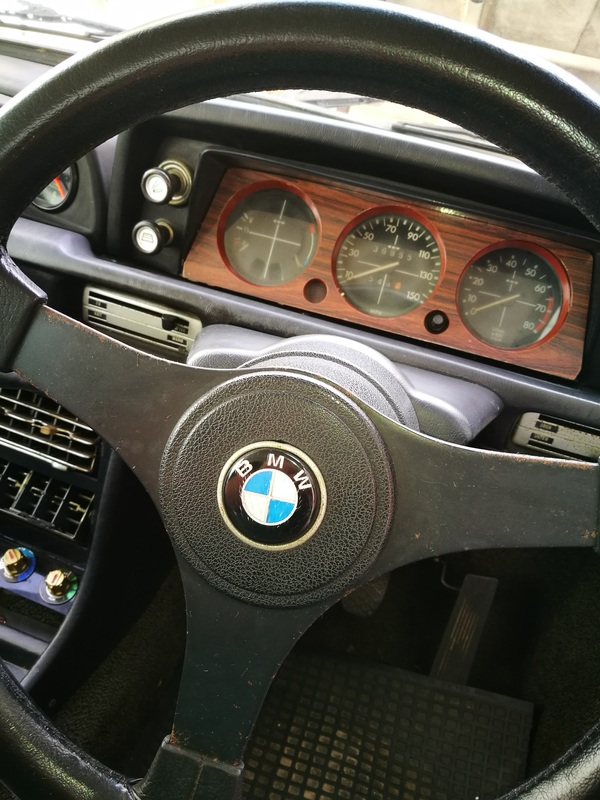 Did you contact BMW Klassik? Their research division can give you a head start. Maybe look under the rear seat to see if the build sheet is present. I'm gonna grab some popcorn and watch where this goes. That's why I'd start with the VIN and BMW Klassik. Then with a verified VIN, start to verify structure specific to the Turbo and see what NLA parts it has or is missing. There was a post/thread identifying all the distinctive-factory mods to the Turbo. I think the rear diff was the only 3:36. 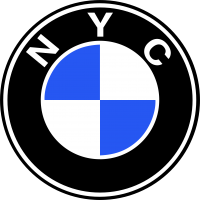 I wrote to BMW classic and they replied immediately saying that they are "are somewhat restrictive with information, because these cars became subject of falsification lately"...! So I sent pics of the original chassis plate, body stamping and engine number...hopefully that will convince them. I know 02's well, especially the 72-74 cars, having owned 5 in the last 30 yrs. It's definately an original turbo body, but agree the paint scheme is wrong. Next time I get at the car i will scrape the blue colour in the engine bay to see if there's white or silver underneath. The owner bought the car from a guy in Kuala Lumpur...he believes it was imported to Malaysia in the early 1980s. Perhaps it was imported into Singapore first, where LHD is illegal...maybe at the point of the RHD conversion it got a full repaint?? I have done an RHD conversion on another 02, it's not a huge job on a standard 02, switch subframe, cut holes for RHD pedal assembly, change dash & wiring loom...easy on a bare shell. On the turbo the exhaust routing probably needs to get creative to avoid the steering column & box. There's evidence of extra heat shielding around the turbo...dunno if that's standard. In the trunk is the radiator, the altitude compensator thing and other small parts...as said, only thing missing is the Kugel and the Enrichment contraption....if anyone has a link to details of those turbo-specific feature set then I will gather photos to help verify it. I think I'd pee a little bit if I found that car..
A few of the specific Turbo bits that I could see in the pictures lead me to believe it is a real turbo chassis. Turbo injection pumps are quite rare you might try Mike Lucas mike@lucasdevelopment.co.uk and see if he has one laying around. I wonder what exhaust manifold they used? You might also contact Norbert Gruenberger n.gruenberger@onlinehome.de with the Turbo club and see if they know anything about this car. I emailed Norbert G and he confirms that from his records this is a 'previously unknown' turbo: It was originally polaris and delivered to UK. 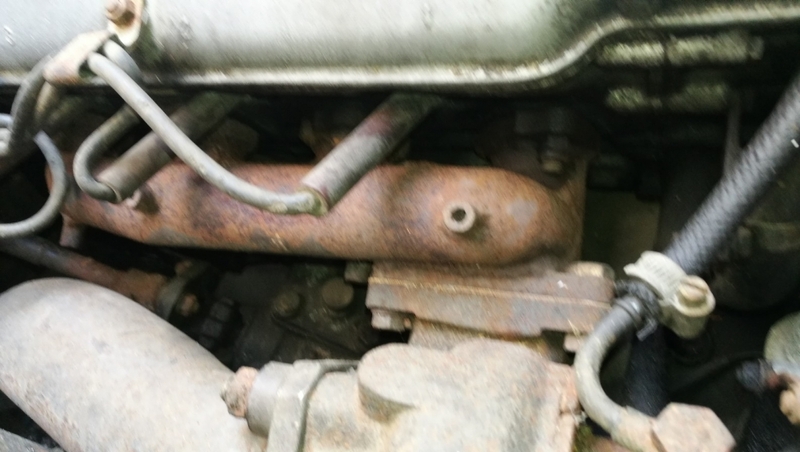 Due to discussions with some of you I now realise that the turbo location is unusual: Its higher and further forward than normal (likely to make way for RHD steering gear)...the exhaust manifold is not the std turbo one: this one has the turbo flange vertical facing away from the engine..whereas standard is horizontal pointing down. So, this is some odd custom turbo manifold?? I don't know if anyone can identify the actual turbo in my original pic above... is that the correct KKK unit?? The other RHD turbo is 4291001 and is in australia now.. 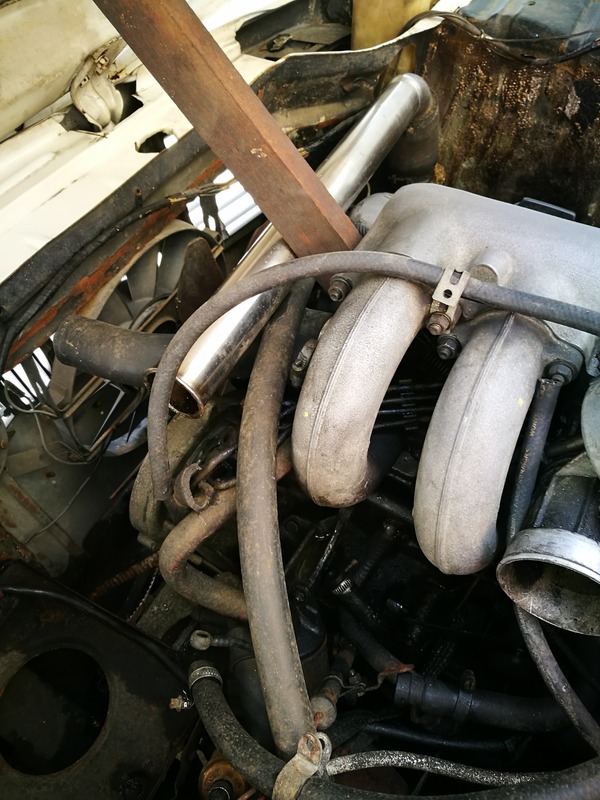 I have not found any pics of the engine bay of that car to see how they achieved the steering... on the UK '02 forum one guy (Richard, i think) said "So there was Two Turbo's converted by BMW UK back in the day, chassis number 4291001 & 429???. One was in Australia and this must be the other one. They used various E21/E30 steering joints and cut a hole in the inner wing so the linkage went outside the Chassis Rail." 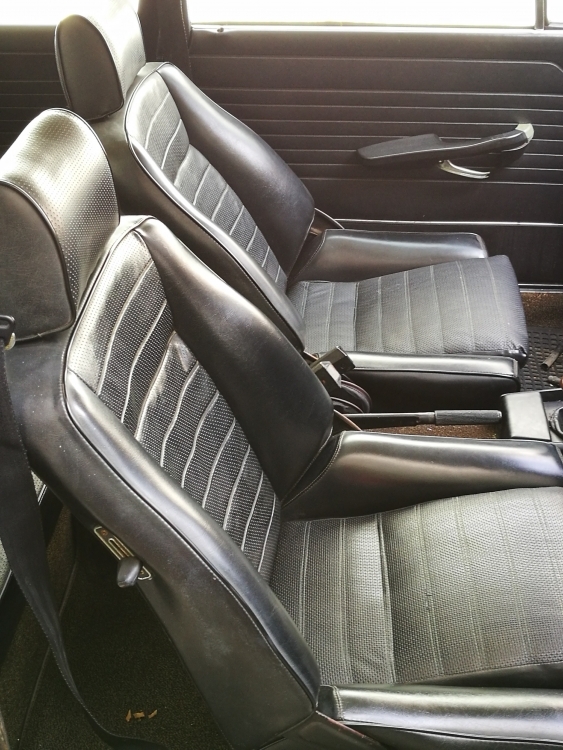 But I think the conversion was in 1974, so the E21/30 was still a distant dream..surely not in the BMW UK parts bin. Great question about the correct turbo charger; I have seen a few sources with differing info. My car's turbo Model:EB32G with the Ausfuhrung (which I think means installation/execution) number 5637 980 1700 But my first backup unit has different Model designation same Ausfuhrung # as the primary unit. Second backup Ausfuhrung is 5637 0 1700. I just noticed the picture of the interior, how in the world did they put A/C on a RHD Turbo!!!! ? Like there isn't enough stuff in the RF corner of the engine bay already. I looked more closely at the RHD conversion and conclude that's it's done quite professionally. The manifold is a cast item which includes heatshield attachment points. The subframe is a standard RHD one, with the steering box in the normal RHD position. With the standard turbo mounted higher and further forward there is space beneath for an AC compressor driven off a double crank pulley. There is no space for the standard air cleaner, it's still not clear to me how the air intake was arranged , it's partly dismantled now. The hardware mounted on the right inner wing/fender is rearranged, the washer bottle is repositioned behind the right headlamp, the coil is mounted in the air plenum by the heater and the hydraulic reservoir is moved back to the old coil location. These changes ensure nothing gets cooked by the exhaust. The exhaust runs high over the steering box and then routes down to the right of the steering column. 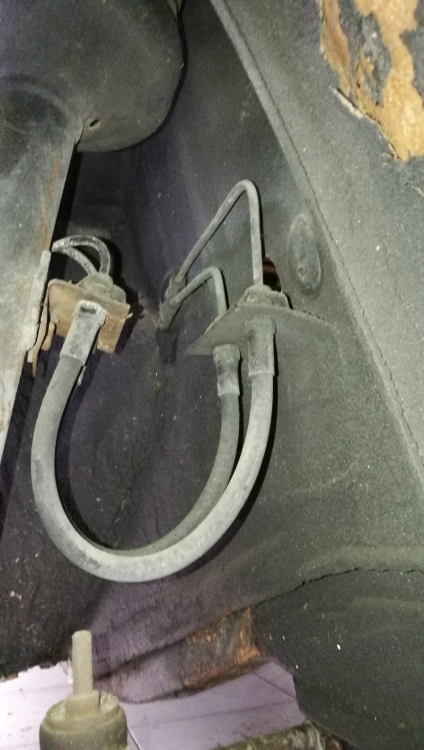 One additional point is that the brake lines to the right front wheel are rerouted to pass through the inner wing/fender close to the bulkhead...again this appears to have be done to limit heat exposure on the brake lines. Finally, the original hole in the floor for the LHD pedal box is sealed very cleanly with a fitted flat plate. All these changes seem well-executed, no self-tapping screws or ugly welds. 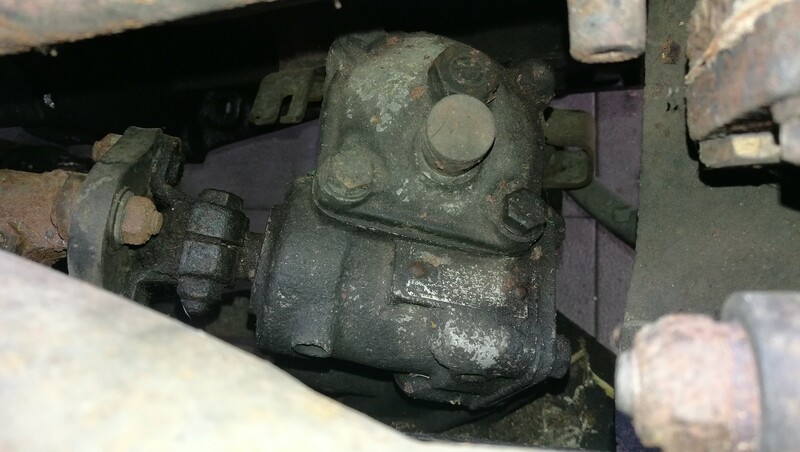 So I suppose these "E21/E30 steering joints" may not have been strictly necessary for or evident on the present RHD car. The European e21, however, did enter the market in early 1975 -- March or April 1975, if I recall. And the e21 adopted the factory turbo's 5 1/2" x 13" styled steel rims -- without the two-tone paint job. 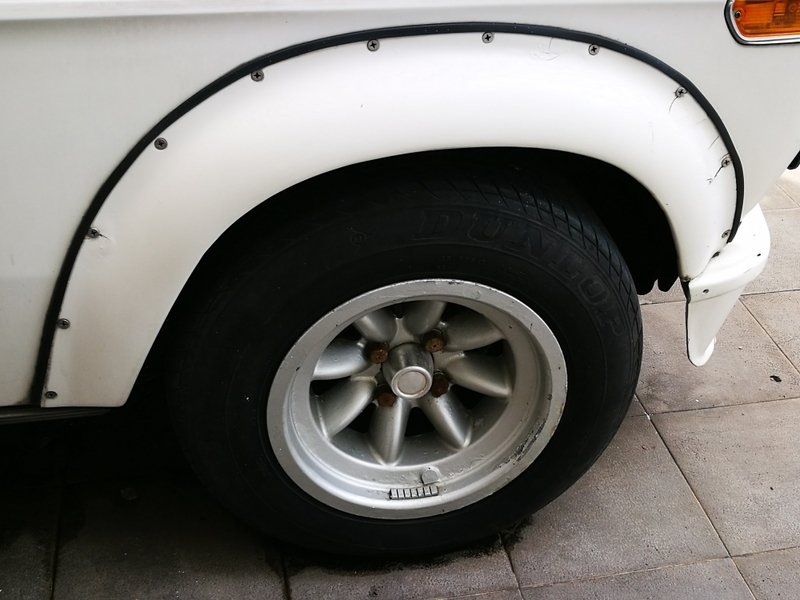 If any said RHD conversions were done at the time of manufacture, e.g., June 1974, right, e21 components were not available. 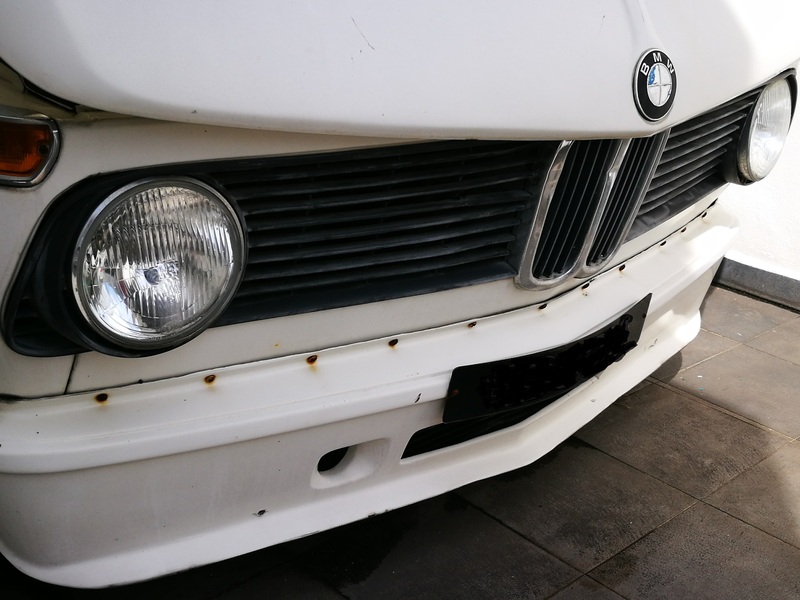 But even an early 1975 conversion could have used e21 parts, if any of those conversions were done post-manufacture. 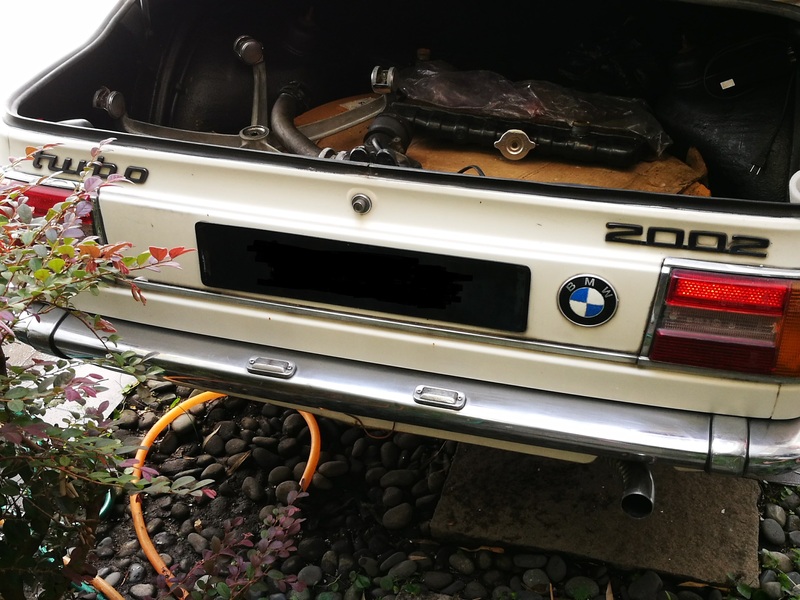 The "E21/E30" story just seems like an odd one for someone to fabricate from whole cloth: perhaps there is a kernel of truth within.